Here is a fun geeky toy for all the trainee Jedi out there, the Star Wars Force Trainer. The Star Wars Force Trainer is a fun geeky toy for kids that lets them practice their Jedi mind tricks, basically you put on the headset and then use your Jedi powers to make the ball inside the tube levitate. And now Yoda is ready (in electronic form) to help guide you through 15 levels of mind mastery. The Star Wars Force Trainer is a fantastic leap forward in technology. The headset actually measures your brainwaves – brainwaves you will learn how to control. 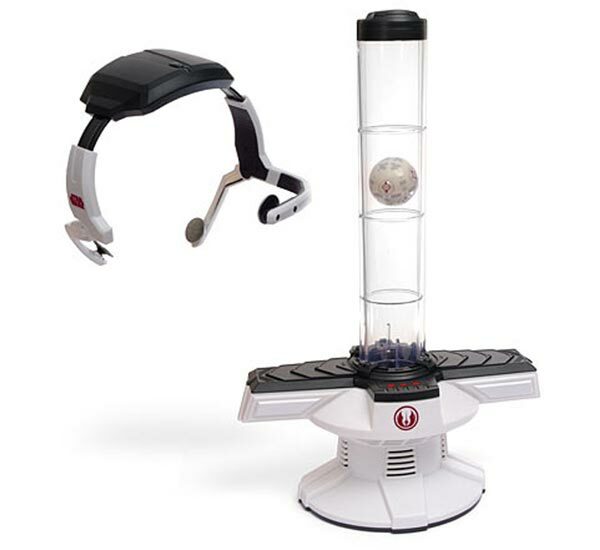 Seriously, your brainwaves will lift the ball in the Star Wars Force Trainer device (well, technically air will, but the strength of your brainwaves will control the power of the air). This is a toy you will buy for your kid, and then take to your own room and never give back. Your geekling may cry, but you will master the Force. And that’s all that matters. With Yoda and the Star Wars Force Trainer, fail you will not. Learn how to master the powers of the Force. Voice guided through 15 levels of Force training by Yoda! Star Wars sound effects confirm accomplishment and provide encouragement throughout your training. Includes an adjustable wireless headset, Jedi training tower w/ball and an informative learning guide. Great fun for kids and adults of all ages! If you want one, the Star Wars Force Trainer is available for $119.99 from Think Geek .